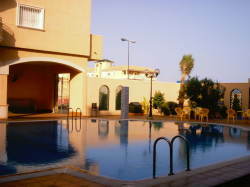 DESCRIPTION: Self-catering APARTMENT with 2 bedrooms and 1 bathroom. There is a lovely communal swimming pool and a secure garage free of charge. WE PROVIDE TOWELS AND BED LINEN AT NO EXTRA CHARGE. SITUATION: The apartment is SITUATED in Cabo Roig, close to lots of shops, cafes, bars and a large variety of restaurants. You can enjoy your drink in the sun on one of the beautiful terraces, under the palm trees and you can enjoy a delicios meal in a traditional Spanish restaurant or, if you prefer, in a traditional Indian or Mexican one, as all tastes meet here. THE BEACH: The Cabo Roig, La Zenia and Campoamor beaches are only a few minutes walking distance away. GOLF COURSES: For the golf lovers , the interntional first class GOLF COURSES of Villamartin, Campoamor and �Las Ramblas lie less than 10 minutes driving from the apartment and there are also other smaller golf courses in the close area. TORREVIEJA TOWN: The Torrevieja town with its sea front restaurants and cafes, promenade and late markets lie a 15 minutes drive to the North and the traditional Spanish beach town of San Pedro and Mar Menor is only 10 minutes to the South. AIRPORTS: The Murcia AIRPORT (San Javier) is 20 minutes away and the Alicante AIRPORT is 45 minutes away.